So here we are: in 2015, our tenth year of existence as the only wolf interest group on the African continent, and the 123rd free e-newsletter. 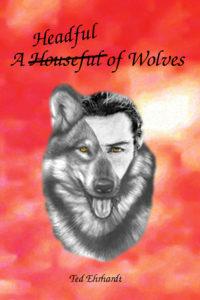 And nothing has changed, at least not to the positive, for the beleaguered wolves in the US. If anything, the hillbilly states are striving for new heights of perversion and spreading their virus of brainless wolf hatred. Read for yourself and be as shocked as I am. An interesting study has just been published that confirms what people who had or have the privilege of living together with wolves have again known for long: that wolf cubs quite readily become attached to humans they have regular contact with and care for them. We have reprinted the abstract of the paper here. We have found another beautiful poem, and Erin provides a brief update on her pack. I am left to wish you all a good 2015 and join you in the hope that it will be a better one for the wolves in the wild than 2014. Hate is contagious. And deadly. And wolves are dying because of it. In Idaho, the vendetta against wolves ruthlessly continues. Now, it’s spreading to Washington state where just last month, the alpha female of the Teanaway pack was illegally shot and killed, throwing the pack’s future into jeopardy. There are fewer than 55 known wolves in the entire state of Washington, making the suspected intentional killing of the alpha female even more tragic. Meanwhile, radical anti-wolf groups in the region are trying to work up a frenzy of fear and hatred by putting up billboard ads featuring anti-wolf propaganda and lies. This kind of damaging misinformation can catch the public’s attention like wildfire – and we can’t let that happen. We’re working hard to prevent fear and hatred from spreading across the West. And we’re stepping up our efforts in battleground states like Idaho, where extreme anti-wolf politicians have caused the deaths of more than 1,400 wolves since 2009 and made a mockery of wolf conservation. We have already lived in a nation where wolves were pushed to the brink of extinction. And we’re not going to let it happen again! We can’t tell you how grateful we are for your continued support. Three Mexican gray alpha male wolves have been found dead – one a month since September. At the last official count, there were only 83 wild Mexican gray wolves clinging to survival. Just 83. Despite this, the U.S. Fish and Wildlife Service (FWS) is still trying to move forward with a flawed management proposal they call a first step. We call it a slow walk to extinction. FWS’ own recovery team scientists have told the agency that Mexican gray wolves will not be safe from extinction unless there are three separate populations that wolves can move between. There need to be at least 750 wolves total, and there must be fewer killings of these rare wolves. While this proposal offers the remaining wolves a larger area to roam, FWS would make it legal to kill them for multiple reasons (including if officials think they eat too many elk). It would also put arbitrary limits on the population and keep these wolves out of the habitats they desperately need to survive. FWS has even said they will consider killing wolves if they grow to be “too many” which they defined as being 300 to 325 wolves in the wild! Time is running out for these wolves. Without the release of new wolves, especially breeding pairs, and the establishment of new populations, Mexican gray wolves will slowly go extinct in the wild. With so few wild lobos left in the world, they deserve a real chance to recover – not flawed decisions that would amount to a slow and certain death sentence. You are their last chance. It’s too late for the three dead alpha males, but there are still others we can save. We’re only weeks away from a bloody commercial wolf-killing contest in Idaho. While it will no longer take place on three million acres of Bureau of Land Management (BLM) lands, the so-called “Predator Hunting Contest and Fur Rendezvous” will take place on other federal lands in January 2015. Prizes will be awarded for the most wolves, coyotes and other predators killed. This is wrong in so many ways; it’s hard to know where to start. It’s still on federal land.While the BLM has withdrawn permission for the derby to take place on three million acres of their land, the killfest is still set to take place on National Forest lands in Idaho. There’s a predator-killing youth division!The proposed Idaho derby offers special prizes for hunters as young as 10 years old! Those Idaho hunters who proposed this derby are outright wrong – America’s wolves belong to all of us. And to enlist children in the wholesale killing is beyond the pale. 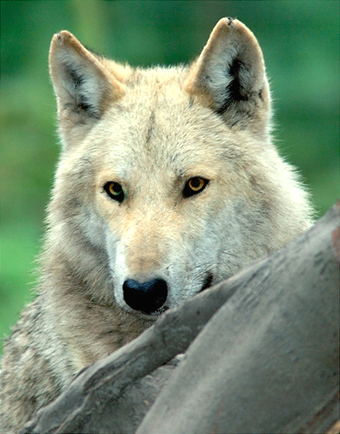 Defenders led the way toward reintroduction of wolves in the Lower 48. And we’ve fought for the wolves every day since. With your help, we’ll see the great work of returning wolves to their suitable historic habitats through to a successful conclusion! The lower 48 states without wolves? We’ve seen what that looks like. And we’re not going back! Thanks for your passion and your support. With a blanket of white snow on the ground, everyone knows – even if you just wound a wolf, you can easily follow the bloody trail in the snow. And in winter, when food is scarce and tracks in the snow make it much easier to put a bull’s eye on their backs, wolves are the most vulnerable to those who want them dead. 4,259 wolves have been killed in the Lower 48 since 2011. And when it comes to killing wolves, snow is an unlikely ally for those who want to kill them. For America’s wolves, every day is a life or death struggle for survival. Defenders of Wildlife has been at the forefront of restoring wolves to the Lower 48 for decades. But we are only as strong as our supporters. We count on wildlife lovers like you to help us fight for the wolves, on the ground in wolf country and in Washington, DC. The facts are clear. If the U.S. Fish and Wildlife’s proposed national delisting goes through, more wolves will die. 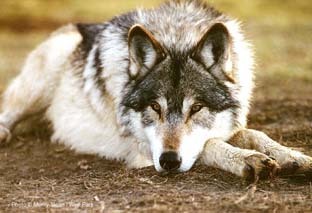 You and I have worked so hard to restore wolves to the Lower 48. We can’t let the wolf haters in places like Idaho resume the slaughter that wiped wolves out in the first place. Thank you for your passion and your generosity. These are especially dangerous times for wolves in Idaho. It’s winter days like these when wolves are at greatest risk from bullets and traps, especially those from federal and state agents. Now that food is scarce, wolves will be out foraging – and they’re much easier to track in the snow. So far, hunters and trappers have killed 129 wolves since hunting season began. As you read this, there’s a good chance a wolf is dying somewhere in Idaho. And if the current trend continues, some of them are likely to be an alpha male or female which are critical to the future of their packs and wolf recovery. More and more alpha female wolves are being killed. 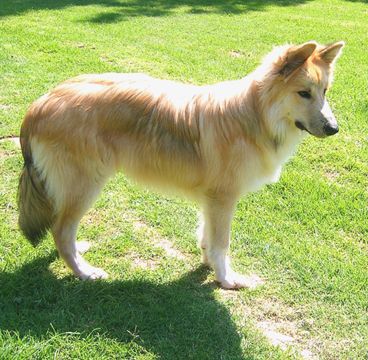 Only the alpha female of a pack breeds, so when she’s killed, the pack is thrown into chaos – and when spring denning season arrives, no pups are born. The steady loss of mother wolves in Idaho has reached crisis proportions. We can turn this around. Many Idahoans do not share anti-wolf politicians’ desire to dramatically reduce wolf populations. 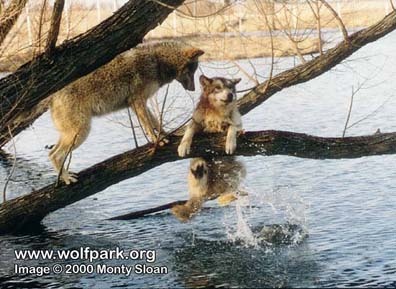 Like you, they understand that wolves restore balance to ecosystems. And they recognize that wolves are important to maintaining healthy ecosystems. Their voices need to be heard. Thanks to supporters like you, Defenders of Wildlife has been at the forefront of efforts to restore wolves to the Lower 48. We were present at the first reintroductions 20 years ago. We’ve repeatedly gone to court to make sure wolves get the legal protection they deserve. And we’re working around the clock, on the ground in Idaho, in Washington, DC, and elsewhere to bring an end to the Idaho war on wolves. Your support helps ensure we have the resources to carry on this fight. We are the voice of America’s wolves, and we’re your voice, too. USA: Utah: Grand Canyon wolf shot and killed? I can’t imagine a more heartbreaking end to one of the most inspiring stories of the year. 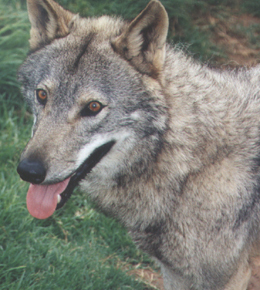 A collared three-year-old female wolf was shot and killed Sunday in Utah. Tragically, we suspect that it’s the wandering wolf that captured our imaginations by showing up on the North Rim of the Grand Canyon – the wolf that some in the Southwest called, Echo. 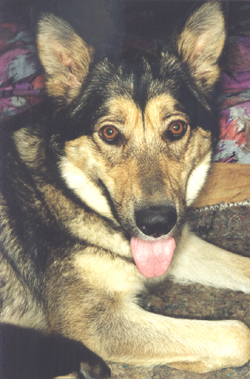 If DNA tests prove that the fallen wolf is indeed this wolf, it is simply too sad for words. 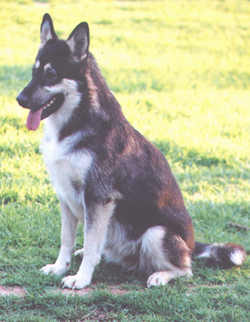 The wolf was killed only 150 miles from the Grand Canyon. Whether this is the Grand Canyon wolf or not, it’s a tragic preview of the killing to come if the federal government finalizes its proposal to delist gray wolves throughout most of the Lower 48. No one fights for the wolves you love harder than Defenders. For decades, we’ve led the way for the return of wolves to the Lower 48. We are your eyes and ears in wolf country. We are your voice in the halls of Congress. The wolf observed in the Grand Canyon last month, travelled hundreds of miles from her Northern Rockies home in search of new habitat and a mate. That’s what healthy wolves do. She reminded us all of the resilience of these magnificent animals. But her possible demise also reminds us that wolves need continued protection under the Endangered Species Act. As you read this, there’s a good chance a wolf is dying somewhere in Idaho. After 20 years of slow recovery in the Northern Rockies, Idaho has pulled out all the stops to drive wolves back to the brink. Idaho is ground zero for wolf hatred – but it’s not the only source of danger. And from now until midnight, your gift will be matched dollar-for-dollar, up to $100,000! When the 114th Congress convenes next week, we’re expecting an unprecedented assault on imperilled wildlife, conservation laws and funding. In fact, this could turn out to be the most anti-wildlife Congress ever. As you may know, next month also marks an amazing milestone for wolves. 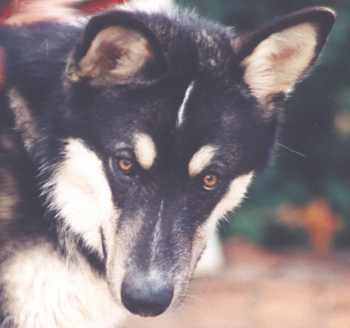 It’s the 20th anniversary of the first wolf reintroduction to the Northern Rockies. 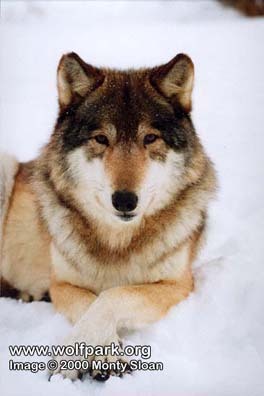 Until January 1995, the western Lower 48 was almost a wolf less world. Thanks to supporters like you, Defenders helped change that. You and I have come too far to see the gains of the last two decades wiped out by greed, ignorance and hatred. We’ve seen what a wolf less Lower 48 looks like – we have already lived in a nation where wolves were pushed to the brink of extinction – and we’re not going back! Twenty years ago today, wolves returned to Yellowstone. It was on this date in 1995 that 14 wolves were released into Yellowstone National Park – the culmination of decades of work led by Defenders of Wildlife. Days later, another 15 wolves took their first steps into the Idaho wilderness. It’s a moment to remember – and celebrate. After nearly being wiped from the map of the Lower 48, wolves once again roamed wild and free in the Northern Rockies. Today, gray wolves exist in roughly ten states – and one has wandered as far as California. Your support through the years has been critical to our success and we hope you take heart in this conservation triumph. You and I both know it hasn’t been easy since those first historic steps were taken 20 years ago. The same ignorance and hatred that decimated wolves a century ago is still alive and well in some areas. The struggle to secure a future for wolves in the Lower 48 is far from finished. But today we celebrate. And from the bottom of our hearts, we thank you for all you have done for wolves and for America’s vulnerable wildlife everywhere. There’s nothing that anti-wolf politicians in Wyoming won’t do to turn the state back into a deadly place for wolves. Now their representative in the U.S. Congress is proposing legislation to strip Wyoming’s wolves of Endangered Species Act (ESA) protections. If Representative Lummis succeeds, wolves in Wyoming will once again be in grave danger. You know what happens when Congress interferes with the ESA and wolves. And it’s not pretty. 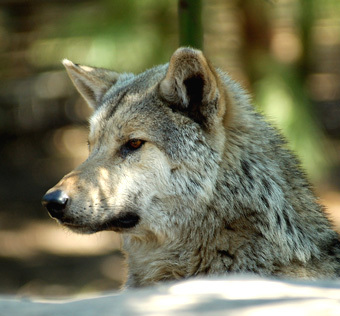 In 2011, Congress forced Montana and Idaho’s wolves off the Endangered Species List. Within months, wolves were falling under a hail of bullets. In Idaho alone, the state legislature quickly rammed through a new wolf killing control board with the expressed goal of reducing Idaho’s wolf population by up to 80 percent! The number of breeding pairs in the state has already plummeted by nearly 60 percent. The ESA law is clear – decisions about imperilled wildlife protection should be based on the best available science, and not local politics. When the best available science is ignored, wolves die in droves. Under Wyoming’s management, wolves were classified as vermin in more than 80 percent of the state. In their so-called “predator zone,” you could kill as many wolves as you could find, every day of the year. 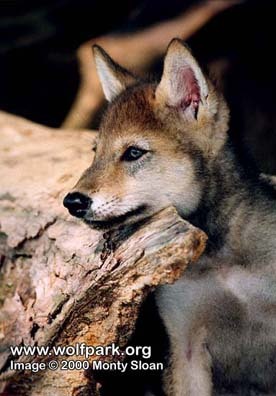 Defenders of Wildlife is the nation’s leading champion for wolves and other imperilled wildlife. As a Defenders supporter, your voice will be heard – in Washington, D.C. and on the front lines of the fight to restore wolves throughout the west. January marks the 20th anniversary of the restoration of wolves to the Northern Rockies. Thanks to supporters like you, we were there. And with your help, this all-important work will go on for decades to come. At the end of December, the collared population consisted of 59 wolves with functional radio collars. There are currently 19 packs and 3 single wolves in the BRWRA. The IFT continued efforts this month to document the overall wolf population this month with track counts and visual observations being obtained on known packs. Food caches and camera traps are also being deployed in an effort to document the uncollared portion of the population. In December, the Bluestem Pack continued to use their traditional territory in the central portion of the ASNF. The IFT documented thirteen wolves in the Bluestem Pack in December. At the beginning of the month the IFT captured video of the Bluestem Pack eating a cow elk that was killed by the Maverick Pack; nine wolves from the Bluestem Pack were documented utilizing the carcass on camera. Two wolves from Bluestem, f1339 and mp1382 have been located separate from the rest of the pack in during the month. In December, AF1294 was located within its traditional territory in the northeast portion of the ASNF in Arizona. M1342 from the Maverick Pack has been travelling with AF1294 throughout the month of December. During December, the Hawks Nest Pack was located within their traditional territory in the north central portion of the ASNF. In December, M1290 travelled between the northern portion of the FAIR and the north portion of the ASNF. M1290 was also located as far south as Hannagen Meadows during the telemetry flight on December 22. On December 28, the IFT obtained a visual on M1290 and observed the wolf by its self. In December AF1305 and m1336 continued to travel together. In the south-central portion of the ASNF throughout November. Genetic work is being performed to identify if these wolves are in fact siblings. 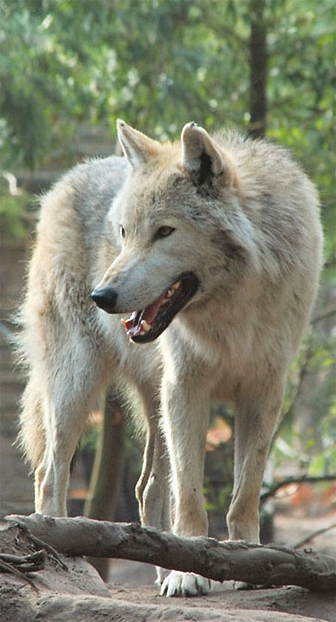 Wolf f1332 has remained in Arizona and has traveled the south central portion of the ASNF. During December, the Maverick Pack travelled within their traditional territory both on the FAIR and ASNF. Wolf M1342 has left the Maverick Pack and has been travelling with AF1294 from the Elk Horn Pack. The IFT located a kill made by the Maverick Pack this month. During December, the Tsay o Ah Pack was located on the FAIR. During December, the Tse ighan lige Pack was located on the FAIR. During December, the IFT located these wolves within their traditional territory in the central portion of the GNF. 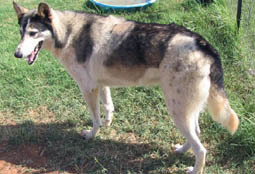 Throughout December the IFT located the Coronado pack within the Gila Wilderness. IFT members hazed the Coronado wolves away from a residence in the Gila Hot Springs area on December 28 to December 31 when the wolves left the area. The Coronado Pack continues to remain within the Gila Wilderness. 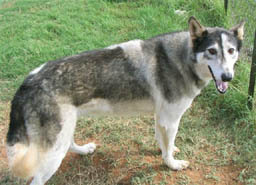 Throughout December, the IFT located this pack within its traditional territory in the west-central portion of the GNF. On December 15, members of the IFT located a cow elk that the Dark Canyon Pack killed and began to eat. Traps were placed near the elk carcass and mp1354 was re-captured and re-collared. During December, the IFT documented AM1158, AF1212, and mp1384 of the Fox Mountain Pack within its traditional territory in the northwest portion of the GNF. A food cache has been maintained for the Fox Mountain Pack this month in an effort to prevent livestock depredations. In December, the Iron Creek Pack continued to utilize their territory in the northern portion of the Gila Wilderness and the southern portion of the Gila National Forest. Throughout December, M1285 and F1295 have been located together travelling the northwest portion of the Gila Wilderness. The wolves have been together for three months and M1285 is now considered part of the Lava Pack. In December, AM1155, AF1115 of the Luna Pack remained in their traditional territory in the north-central portion of the GNF. The IFT has maintained a food cache for the Luna Pack in an effort to prevent livestock depredations. Wolf m1337 is displaying dispersal behaviour, and has not been located with the Luna Pack in December. Although in recent months single M1284 has occasionally been located with members of its natal pack; it remained separate during December. In December, M1296 travelled between the northern portion of the GNF in New Mexico and the north-eastern portion of the ASNF in Arizona. Throughout December, the Prieto Pack was located within their traditional territory in the north-central portion of the GNF. A food cache was maintained into December in an effort to prevent livestock depredations. During December the IFT located AF903 travelling with m1345 within the traditional territory of the San Mateo Pack. Throughout December, the IFT has located the Willow Springs Pack in their traditional territory in the north central portion of the GNF. Wolf mp1391 was not located in December and m1338 displayed dispersal behaviour and roamed throughout the GNF during the month. A food cache was maintained for this pack into December to prevent livestock depredations. Throughout December, M1284 was located travelling the west-central portion of the GNF. No mortalities occurred during December. During December there was one livestock depredation report and one nuisance report in the BRWRA. On December 8, Wildlife Services investigated one dead cow in New Mexico near Rainy Mesa. The investigation determined the cow was hit and killed by a car back in September. 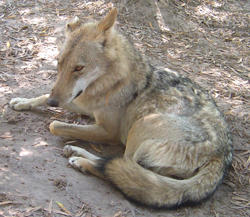 On December 24, members of the Coronado pack (M1051 and an uncollared pup) were reported exhibiting nuisance behaviour. 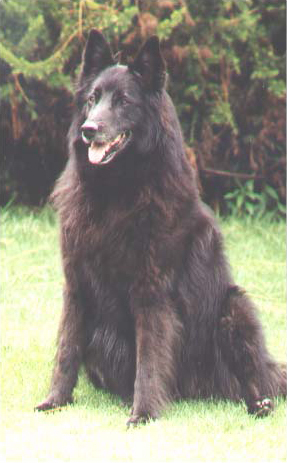 They were observed near residences with livestock and interacting with domestic dogs through a fence. The IFT responded to the area to monitor and haze the wolves. Hope you all had a Blessed and wonderful Christmas and may 2015 be filled with love, hope, laughter and many Blessings! To raise much needed funding to establish a new Cheetah breeding population in the wild, we are offering a few accommodation vouchers at a discounted rate at both Savannah and Bukisa Camp. Please email us at reservations@sanwild.org to book yours today. 4 Vouchers of each deal available. “first come, first served” basis. Vouchers need to be paid within 24 hours after confirmation. No refunds on accommodation specials. You are the reason why, even on the most difficult of days, I’m optimistic about the future. Your tireless support is a big reason why we’ve made significant progress for wildlife in 2014. As we continue to be unrelenting in our fight for the future of gray wolves, it’s important to remember that there are a number of accomplishments worth celebrating. Defenders’ members rose up and successfully pressured Animal Planet to pull a faux documentary that demonized wolves. But as we enter 2015 and face what looks to become the most anti-wildlife Congress in history, we can’t help but worry for our nation’s wolves and other imperilled wildlife. As we face these daunting challenges, we are so proud to be the voice for imperilled wildlife that has no voice of its own. And we are proud to be your voice, too! The acting Environment Minister, Walter Mzembi has stated that Zimbabwe will not be deterred from exporting 62 baby elephants to China, France and the United Arab Emirates. He said that Zimbabwe has in excess of 80 000 elephants but only has the capacity for 42 000. We don’t believe this figure because a proper count hasn’t been done since 1997 so we don’t think anybody knows exactly how many elephants there are. A count was done in Hwange National Park late last year and 22 000 elephants were counted there. Hwange has the highest concentration in the country. Mr Mzembi stated that the reason for the worldwide outcry about the exportation is political and that the people who are objecting don’t want Zimbabwe to make any money. The government received a letter from 31 tourist agents in America who stated that if the exportation goes ahead, they will not be bringing any tourists to Zimbabwe. In a new survey released last month, it showed that the elephant population has decreased by more than 40% in the Zambezi Valley, Matusadona and Chizarira areas. The survey is a partnership between the Great Elephant Census, a Mr Paul Gardner Allen Project and the Parks and Wildlife Authority. A professional count needs to be done. Every year in the hot season, elephants come into Zimbabwe from Botswana and Zambia to look for water in Hwange National Park. It stands to reason then that all the elephants in the park are not Zimbabwean elephants and the counts are always done in the hot season. The count should be done in winter and simultaneous counts should be done in Botswana, Zambia, Mozambique and Namibia. This would give us a much better idea of the true elephant population. We had planned a demonstration to take place on the 27th January 2015, the day of the opening of parliament. The demonstration was to be in protest of the export of baby elephants to China. In Zimbabwe, if a gathering of more than 5 people is to take place, police clearance has to be obtained first so our colleague, Kenesias Dambakurima applied for police clearance and it was refused. We intend to apply for another date, possibly the 5th February, but it all depends on the reason for the refusal. If it was just because it was to be on the same date as the opening of parliament, we may be granted permission to have the march on another date. Several petitions have been started around the world to try and put a stop to the export of the elephants and we would like to appeal to those people who have started them to print out the petitions together with all the signatures and hand them in to their respective Zimbabwean embassies in their countries. Instructions should be given for the petitions to be sent by overnight bag to the relevant ministers in Zimbabwe. These are the President, the Minister of Environment and the Minister of Tourism. The petitions should all reach Zimbabwe at around the same time, 26th January 2015. This would make a much bigger impact than if I personally print them out because they will probably accuse me of forging them. I would be most grateful if this could be done. The First Lady, Grace Mugabe has evicted around 200 families from Manzou Estate farming area in Mazowe. They were literally thrown out in the street and their houses burnt. She intends to turn the area into a game reserve for the big 5. These animals will be transported to her game reserve and we are wondering how she will afford to do this when National Parks don’t have enough money to pay the salaries of their employees. There are no game fences there and these are necessary to prevent the wild animals from mixing with the domestic cattle etc. and spreading diseases. Double fences are required, 2 metres apart to prevent the animals from mixing. Thanks to Birgit Rödder from Germany (info@scidesign.de) for making us aware of this very interesting article. 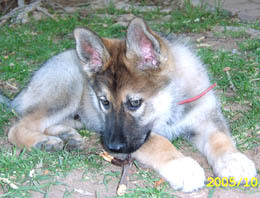 Previous research suggested that 16-week old dog pups, but not wolf pups, show attachment behaviour to a human caregiver. 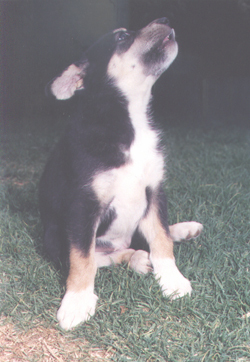 Attachment to a caregiver in dog pups has been demonstrated by differential responding to a caregiver compared to a stranger in the Ainsworth Strange Situation Test. 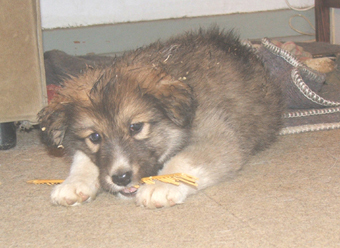 We show here that 3–7 week old wolf pups also show attachment-like behaviour to a human caregiver as measured by preferential proximity seeking, preferential contact, and preferential greeting to a human caregiver over a human stranger in a modified and counterbalanced version of the Ainsworth Strange Situation Test. In addition, our results show that preferential responding to a caregiver over a stranger is only apparent following brief isolation. In initial episodes, wolf pups show no differentiation between the caregiver and the stranger; however, following a 2-min separation, the pups show proximity seeking, more contact, and more greeting to the caregiver than the stranger. These results suggest intensive human socialization of a wolf can lead to attachment-like responding to a human caregiver during the first two months of a wolf pup’s life. Behavioural Processes, Vol. 110, January 2015, pages 15-21. Well, there is not much to report right now. All pack members are healthy, no further problems on that side, and we have all survived the festive season without damage to the Christmas tree or our stomachs from over-eating. The four-legged members of the family truly enjoyed a small feast of sardines, with some cow hoofs and chewing toys for dessert on Christmas eve. New Year’s Eve was also a rather quiet event because it started raining ten minutes to midnight and didn’t stop for hours, which certainly spoiled the night for the firecracker nuts, but was a welcome blessing for us. For the past few weeks, we have been having sort of a heat wave with almost daily thunderstorms and lots of rain at times, so that humidity is like we still remember from our visits to the Southeast Asian rainforests. 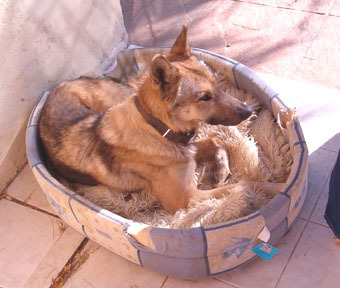 Not really the ideal weather for the pack that will spend most of the day hours lazing inside the house until the sun starts to set and it cools down, but what can you do about the weather? So far, the New Year has treated all of us nicely, and we hope this will also be the case with all of you.